If one reads through the works of famous musicologists such as Raza Kazim, it becomes clear that “Classical Music’ serves a purpose that is much greater than the music that we hear today. Classical Music is eternal; it serves to emanate the reflections of society and as Kazim would have it, of “humanity’s higher fundamental purposes”. This website lists famous composers who dedicated their lives to the propagation of music. Fame, for them, was only a mere ‘consequence’ of their quest for excellence. As you will find, many of these composers, including Franz Schubert and Caetano Veloso, lived in extreme poverty before their talents were truly realized. Some even pushed through extraordinarily adverse conditions such as blindness (Johann Sebastian Bach, Frederick Handel) and deafness (Ludwig Van Beethoven) to pursue their craft. The only thing pushing them forward was their pure love for the magical phenomenon that was music. Many of these composers were unusually gifted; some possessed exceptionally rare gifts such as perfect pitch, tonal memory and fabulous dexterity, while some were even famous as child prodigies who could play virtuosic pieces at public recitals. Composers are generally classified by the era that they played in. The Renaissance Era, which is generally accepted to be between 1400 and 1600 (C.E. ), was renowned for its polyphonic compositions. Before the Renaissance, it was extremely difficult to obtain accurate historical information of composers. The Baroque Era is generally accepted to be from 1600 to 1760, and it was characterized by the birth of the opera, and the stardom of the violin. The Classical Era, which ranged from 1750 to 1830, was characterized by the use of the piano and the harpsichord, and the birth of the symphony. The Romantic Era, and the Modern and Contemporary Eras followed, each having their own distinctive style of music. Even so, the transitions from one era to the other were gradual, and their ‘definitive’ style of music were in no means binding, after all, the success of a musical piece was dependent on the audience, and their opinions were by no means only dependent on time. Thus, the historical ‘boundaries’ of these eras are generally debated, and their definitions are also very vague. Almost all composers were extremely trained in music theory. 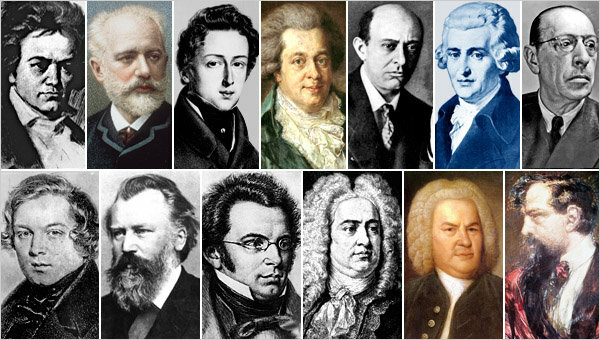 However, what made these composers brilliant at music was how well they could use music theory to explore their imaginations. Some composers specialized in harmony, counterpoint, or fugue, while others went as far as exploring exceptionally unusual methods such as atonal composition. Many composers are also famous for their contributions to music theory and for their own personal compositional techniques; Arnold Schoenberg for example, is renowned for inventing the famous ‘twelve-tone method’ that was used and studied by many other musical legends. One cannot deny that the advent of technology radically changed the way that the masses perceived music; on the one hand, it helped the rise of newer, exciting musical avenues such as electronic music, and on the other hand, it made music much more accessible. Today, one can listen to a live recording of a performance of Mozart’s “Symphony No.40” needing nothing more than an internet connection and a laptop. In the Classical Era, such a privilege was only limited to the class that could afford tickets to a concert hall. Nevertheless, the legacy of these legendary and famous composers shall live on in their music, no matter where it is heard.